Excited for the official release of the LG latest flaship smartphone for 2018? The latest in LG’s series of premium flagship phones, the G7 ThinQ offers an array of ground-breaking audio-visual technologies, a highly advanced processor that run even the most demanding tasks and apps with ease, and deep AI integration. Packing powerful sound, a brighter display, and an amazing low-light camera, the LG G7 ThinQ enhances your smartphone experience. Get your hands on the LG G7 ThinQ weeks before it launches, and avail of freebies, including a LG TONE INFINIM Bluetooth stereo headset worth PHP 7,490, with your purchase. The pre-order promo is available at participating LG concept stores from May 30 to June 10, 2018. Customer may pre-order an LG G7 ThinQ from participating stores by paying a Php 2,000 downpayment within the promo period (May 30 to June 10, 2018). Downpayment can be paid in cash or straight payment via credit card. Customer may claim the LG G7 ThinQ in the store where it was pre-ordered by paying the balance (SRP less down payment) starting June 11, 2018 until sixty (60) days after start of claiming period. If customer does not claim the pre-order within sixty (60) days (until August 10, 2018), the reservation will be cancelled. This offer is not convertible to cash. This offer cannot be availed with other promotions. 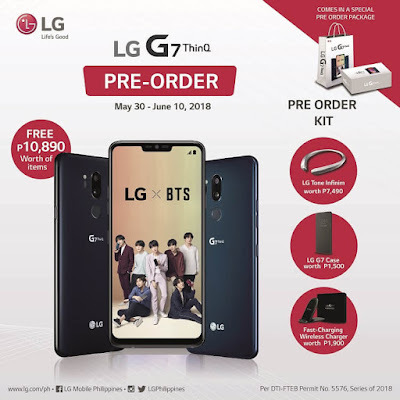 Act fast and pre-order the newest LG smartphone, G7 ThinQ before its official June launch date, which will give you PHP 10, 890 worth of premium LG items. Life is Good indeed!